It is definitely not breaking news that it has been absolutely bone-chilling cold across most of the country lately. I’m not thrilled about it, but instead of fighting it, we’re embracing it here! I made something really special with the weather in mind. 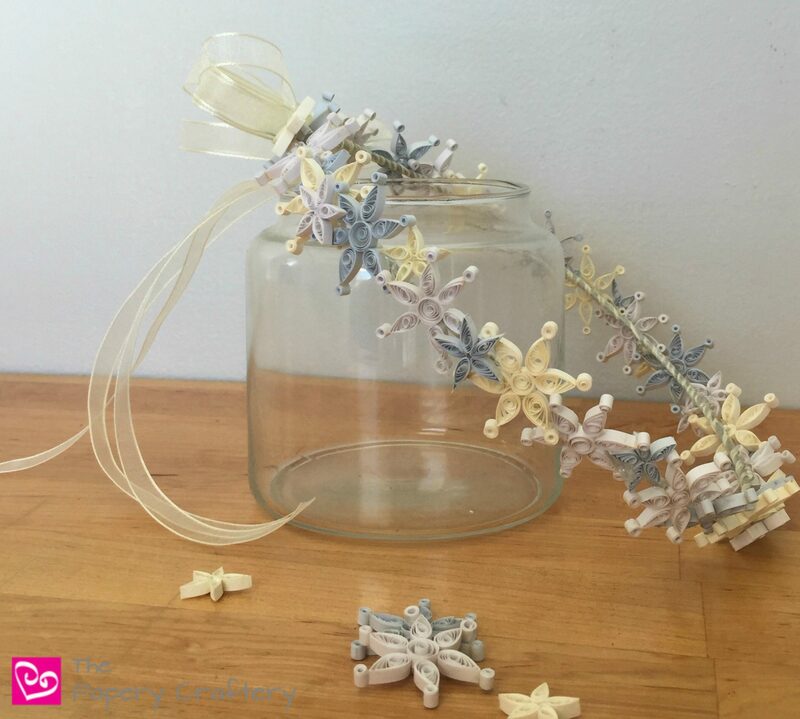 This week, I’m saying welcome to winter with a winter princess crown made from quilling! My Bean was my muse and my very willing model for this project. She is in full-on princess mode right now. I only wish I had thought of this last month for her winter themed 3rd birthday party! The first step was to form the base of the crown. From my sculpture days in college, I had some heavy-duty armature wire. Mine is about 1/8″ thick, so I need to cut it with professional cutters. But it really holds it’s shape! After measuring my girl’s head to make sure it would fit. I cut the wire to the right size. I bent the wire into an oval and made two quick loops to make sure the shape would stay. For reference, Bean’s crown is made from about 21″ of wire. Be sure to cut or bend any sharp edges! It’s going to be covered later, but you can never be too careful. I also came across some ivory ribbon that was perfect for wrapping the wire to hide the metal color. Hot glue really helped here. (Here’s my favorite hot glue gun!) Watch those fingers, please! I decided to use just two different quilled designs for this winter princess crown ~ snowflakes and stars. Since there were multiple colors and my goal was to add a lot to this little crown, the shapes had to be simple. The snowflakes were exactly the same ones that I used for these winter gift tags, and the stars were made with five small strips (about 2″ or so) rolled and pinched into a marquise. To keep the crown looking cool and icy, I stuck to three colors : pale blue, platinum white, and white parchment, which is a paler cream shade. You’ll probably have to make quite a few more of these than you think you’ll need. For Bean’s tiny head, I had to make about 21 snowflakes and 16 stars. I used hot glue again here to attach the quilling. Since I was looking for more of a polished look, I layered my shapes a little and alternated the colors all the way around. Remember how I mentioned that you didn’t have to get too hung up on the closure of your crown? I used some of the ivory ribbon again to cover it ~ easy peasy! 3 strands were glued right on top of the lumpy wire loops, and I made a simple layered bow to place on top. Here is a link to a tutorial for a similar bow! Once the ribbon was on, it was time for a photo shoot with my favorite girl! Can we just take a moment to admire this little girl’s highlights? Wowza! Even though Bean sat (surprisingly) still when she was modeling the winter princess crown, it’s probably not an everyday dress-up crown. It is a little fragile. Next time, I would add a bit more glue to the fragments of my snowflakes for extra protection. But this would be lovely for a winter wedding! Or turn the quillings to face out on your wire base to make more of a door hanging! Above all else, just be inspired! I know that it can be hard to be motivated to craft when it’s so cold outside, but honestly, it always warms me up! What have you all been working on during this cold snap? Crafting anything fun? Leave some comments below and let me know all about it! I don’t know how I missed that this week. Thanks so much Ann!